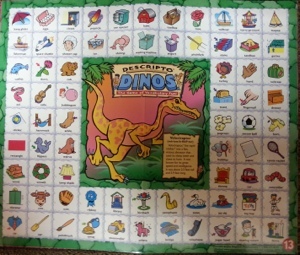 Descripto Dinos, available for $54.99 by Super Duper Publications, is a fun and engaging game that will have the children you work adding those pesky attributes to nouns in no time. Want to play? Well its easy to start! Have the child select their favorite colored game board and game chips. 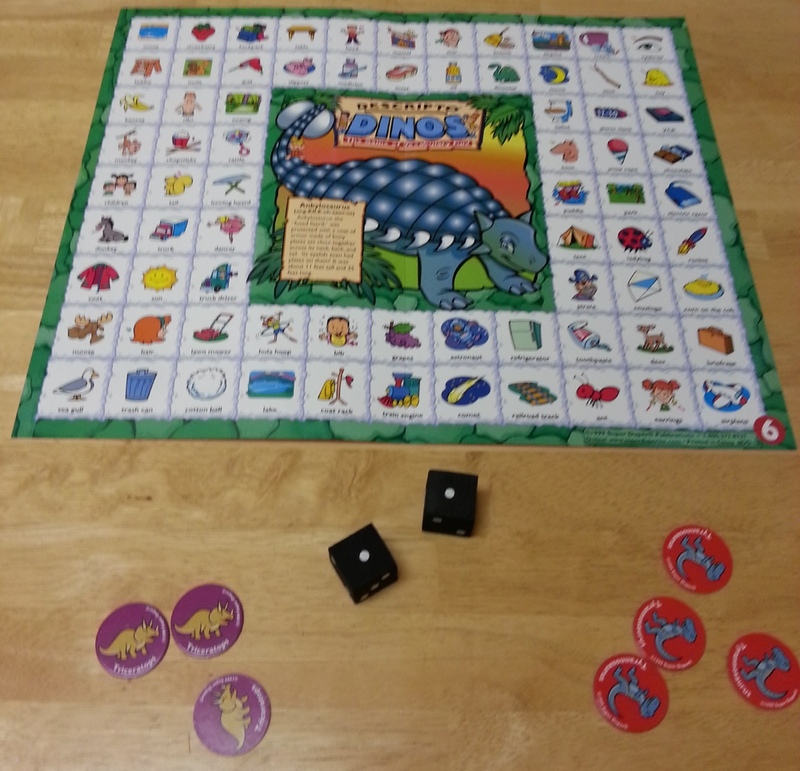 Each game board has a different dinosaur on it. You roll the foam dice, which Super Duper includes with virtually every product right? I mean they must have a whole warehouse dedicated to these dice. The number you roll determines how many attributes the child has to say in order to earn the ‘square’ . For example if they roll a two and just say “It’s yellow” and point to the mustard you would prompt them to ” Tell me more.” You would want them to expand it to “It’s yellow and you put it on hot dogs” etc.. There are multiple items on each board that are similar in category, shape, color, functions etc.. to help the child add more attributes to their description. There are a variety of ways to play but the main goal is whoever puts all their chips on the board first wins! You said it’s yellow? Do you mean the couch or the mustard? Example game board, dice, and chips. 90 game chips in red, green, orange, yellow, purple, and blue! The instruction book is handy because it lists all the words on every game board. The list can be used to adapt the game to work on things like articulation. You can do this by finding the game board with most of the particular sound you want to work on. 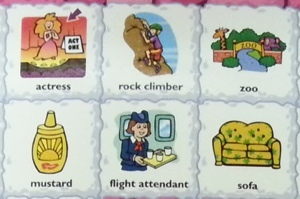 The game can also be adapted for things like expressive language by having the child build sentences using the word or by simply expanding vocabulary. With receptive language you can work on things like following directions using different colored chips, concepts like next to and under, or by finding objects by function or category. lockout effects a lot of tghins. Yes madden, it also affects citys, the usual money they bring in for ticket sales, food at the stadium, they dont get any money. Citys also lose money, becuase without games theres no tailgating, food places downtown, will lose a lot of cash, people who make money from parking lose money, everyone loses money. Pizza places, stores, fast food, tv companys, direc tv, sunday ticket brings in a lot of money. without football no more monday night partys, so not as much bussiness, stores wont sell the chips, pretels, napkins, ect. Football is one of the biggest profits in america. Hi, there! Thanks for this review of Descripto Dinos. I’m looking for nice vocabulary apps. This looks like a cool app to use with my ESL students. I’m going to check this out.